I just finished reading D. A. Carson’s, Scandalous. Let me caution you first with a little warning — this is a THINKING book. Not a light book, not a book to read while multitasking, not a “I finished it in one day” kind of book. I found it difficult to finish more than a chapter a day because the material was so deep. While I think I would like to re-read this book to prepare my heart for resurrection week, it was still plenty powerful enough without the seasonal remembrances of what Christ did on the cross. Carson focuses on the cross for much of the book — about what the cross accomplished, about the ironies surrounding Christ’s death, and what the whole of Scripture agrees to concerning what’s to come. He went from the Gospels to Revelation then back to the Gospels again, his sole focus on Christ and what the cross means. He also spends some time discussing the death and resurrection of Lazarus in the midst of all of this. (Giving what I believe is the best explanation and interpretation of the text that I’ve EVER read/heard.) 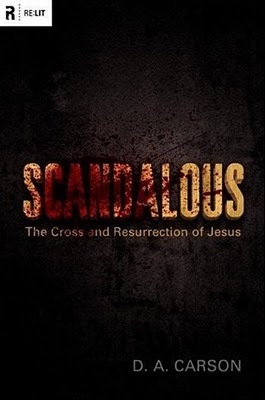 His central focus in revisiting these passages is to emphasize how “scandalous” Jesus Himself is, always doing the unexpected, bringing about God’s glory in radical and literally awesome ways. I always appreciate reading books that really put Scripture into context — conveying what the people of that time actually thought, translating straight from the original text, and relating specific passages to the WHOLE of Scripture — and this book does just that. I cannot recommend Scandalous enough. And for those who might just randomly find themselves in Chicago in April (you never know! ), Dr. Carson, along with many other challenging pastors (among them another favorite of ours, Dr. Timothy Keller) will be speaking at the Gospel Coalition. It’s worth looking at the website and the speakers, even if you can’t make it, just to add more titles to your reading list!